King Marmaduke and Queen Marguerite lived in a royal palace. They wore royal crowns and royal robes and ate royal food, but all of their royal subjects thought they were a royal pain. Every morning King Marmaduke went to the window of his royal palace and summoned his subjects to bring him food. He didn't want just any food. He wanted truffles, chocolate eclairs, raspberry tarts, steak and kidney pies and hot loaves of wheat bread. If his subjects didn't bring what he wanted, he made them go to the royal cathedral and clean the stained glass windows. Queen Marguerite went to the royal cathedral every day and supervised the unfortunate souls who'd been sent there to clean. She went from window to window, examining every piece of glass, making sure it sparkled like diamonds. If it didn't, she assign that person an even worse job, like scrubbing the stone floors, or polishing the wooden pews. If they didn't do that right, she made them brush her hair or clip her toenails. Needless to say, the royal subjects weren't too fond of the king and queen. “Nobody showed up this morning. I'm going to find my subjects and see why. Would you like to come with me?” King Marmaduke put his arm out and his wife put hers under it. They went into the town. Each house was quiet. There was no smoke coming out of the chimneys, no smell of food, nothing, not even a dog or cat. When they reached the last house they saw a note pinned to the door. As your royal subjects, we are tired of being your slaves. We have moved away to another village and won't come back unless you promise to stop making us bring you food and polish the stained glass windows in the royal cathedral. Until then, you can do everything yourself. “I suppose I could hire a cook to fix all the meals instead of commanding our subjects to bring us food.” The king sighed. He ordered one of his squires to post a notice on every door in the town. The next day when King Marmaduke stood on his balcony, he watched all his royal subjects moving back into their houses. Never again did he make them bring him food. He started being nicer to them and inviting them to the palace for banquets. The queen hired a villager to clean the windows in the cathedral. She paid him money from the royal treasury. The windows sparkled and the queen smiled. 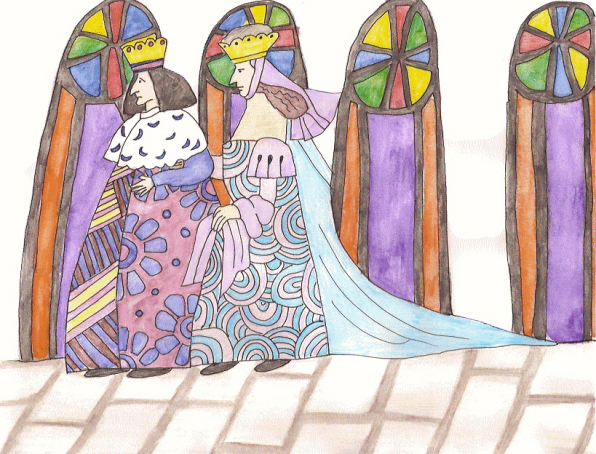 The royal subjects were happier and the king and queen were too.